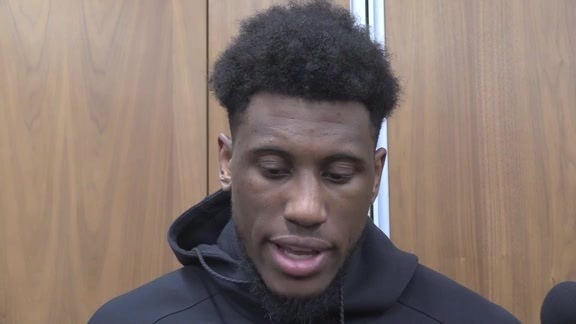 April 7, 2019 - Pacers players Darren Collison, Wesley Matthews and Thaddeus Young discussed Indiana's 108-96 loss to the Brooklyn Nets at their last home game of the regular season Sunday night at Bankers Life Fieldhouse. 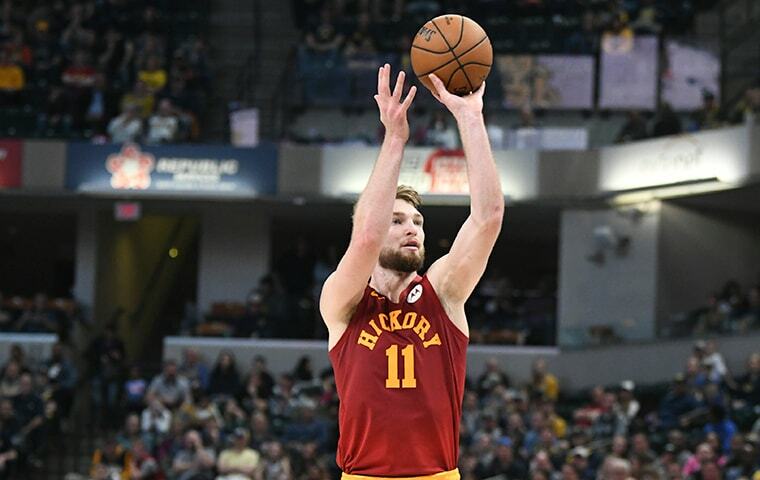 April 7, 2019 - Following their game against the Nets, the Pacers took some time to sign autographs and give away gear to fans as part of Fan Appreciation Night presented by Indiana Members Credit Union. 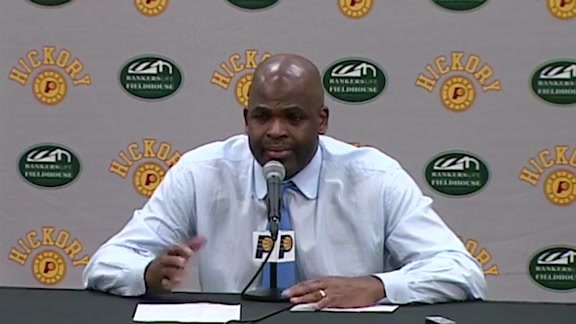 April 7, 2019 - Pacers head coach Nate McMillan talked to the media following Indiana's 108-96 loss to the Brooklyn Nets on Sunday evening. Thirty-five seconds into the game, Joe Harris got an uncontested layup off a backdoor cut and assist from D'Angelo Russell. Sixty-five seconds into the game, Russell hit a 3-pointer on an assist from Harris. One-hundred-and-one seconds into the game, Harris ran off a screen and got another layup off a lobbed pass from Russell. One-hundred-and-two seconds into the game...with 10:18 still to play in the first quarter...with fans still settling into their seats...with players just starting to work up a sweat...Nate McMillan had to call timeout to stop the bleeding. Afterward, with Brooklyn having taken a 108-96 victory from the Pacers at Bankers Life Fieldhouse, the Pacers' coach was at a loss for words. Temporarily, at least. "That start was really bad," he said. "Just no energy at the start of this game." McMillan then paused, forced a couple of one-note staccato laughs, and lifted his thumbs in resignation. "I can't explain that," he said. "I just can't." This isn't how the Pacers wanted to wind down their season. They've won just seven of their previous 21 games, with Wednesday's season-closer in Atlanta offering the last opportunity for a dollop of redemption before they open the playoffs on either Saturday or Sunday in Boston. They went into last Friday's game against the Celtics declaring their intention to earn homecourt advantage, but lost by 20 points. 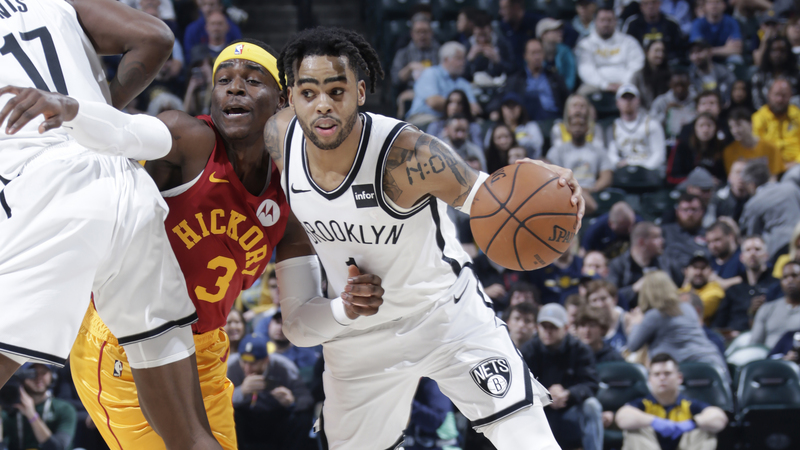 They went into Sunday's game against the Nets declaring their desire to reconnect with one another and regain their mojo, but managed nothing better than a one-point lead in the first quarter and lost by 12. What now? Do they just need rest? A win? A sit-down with the team psychologist? McMillan will be mulling over the possibilities in the days ahead. The Pacers will be off on Monday, practice on Tuesday, play in Atlanta on Wednesday, and then have two or three days to prepare for Game 1 of their playoff series. With nothing tangible left to play for, he appears to be leaning toward resting veterans such as Thaddeus Young, Bojan Bogdanovic, and Cory Joseph, all of whom have played all 81 games this season — whether they like it or not. The grind intensified when Victor Oladipo went down for the season on Jan. 23, and the Pacers look anything but energized. "I may have to make decisions for some guys," McMillan said. "Our motor is very low right now. That effort that we saw at the start of the game, we can't start like that. "We've squeezed our guys a lot to get to this point. Is there anything left? Yeah, I think (so). We're in the playoffs. We'll try to get ourselves prepared for that." The Nets weren't the most forgiving opponent, given the critical nature of their circumstance. Needing one more win to clinch the franchise's first playoff berth since 2015, they had built-in motivation and energy despite having played the previous night in their win at Milwaukee. They celebrated loudly in the locker room to the accompaniment of music, as if they had won a championship. "There was another level of focus, another level of being locked in," Brooklyn coach Kenny Atkinson said. "I mean, they wanted it so bad. There was an extra energy in there these past few games." Those early layups the Pacers gift-wrapped for the Nets were foreboding, and the box score clearly reflected the respective energy levels. The Nets grabbed 13 offensive rebounds in the first half, 17 for the game. 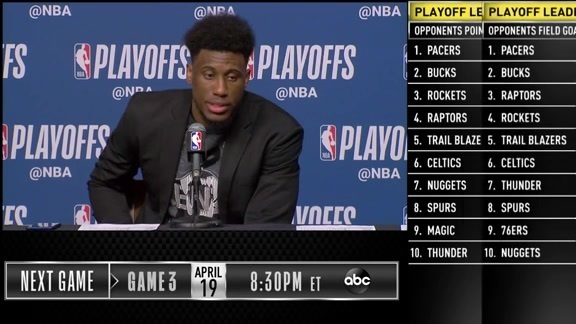 The Pacers managed just five overall. The Nets got to the foul line for 22 free throws while the Pacers attempted just seven and hit four, both season lows. The irony was that Atkinson, as other opposing coaches have done this season, praised the Pacers as one of the most physical teams in the NBA before the game. 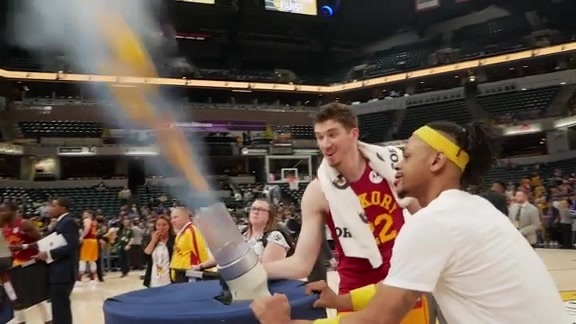 When that was brought up to McMillan before the game, he offered a mild objection. "I would like for us to be more physical," he said. "I've heard that before...(but) we're going to need to be more physical, especially this time of the season." Told what McMillan said, Atkinson volleyed an objection of his own. "I want to ask Nate how they could be more physical," he said. "And how we could steal some of that. That's their calling card." The Pacers didn't play that card this time. They have some valid excuses for their recent slog. Fifteen of their previous 16 opponents will be in the playoffs, and nine of those games were played on the road. Until Friday, they were competitive in each of their previous seven defeats. They not only have played without Oladipo, their lone All-Star last season, but in stretches without point guard Darren Collison and center Myles Turner. Collison returned Sunday from a three-game absence but hit just 2-of-12 shots while scoring four points. Turner only played 17 minutes, 46 seconds before leaving with a sore right ankle and back spasms. 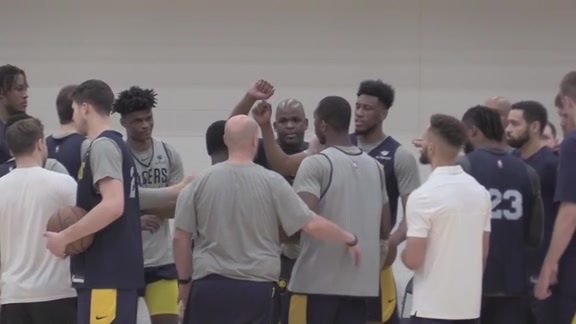 McMillan said Turner could have returned if needed, but the need had long since passed by the time he returned to the bench after going to the locker room with a trainer. They might benefit from a light workload this week, but on the whole the Pacers need to rediscover the energy level that made them one of the league's surprise teams most of the season. Young says it starts with a rededication to defense, which in turn would spark the offense. "Defense is what's gotten us to this point of the season," he said. "Defense wins games and we all know that." "Going back to the basics, whether it's going back to high school drills doing close-outs or putting guys in position to where they have to come over and help the other guy out," he said. "All types of defensive drills that get us back into sync." 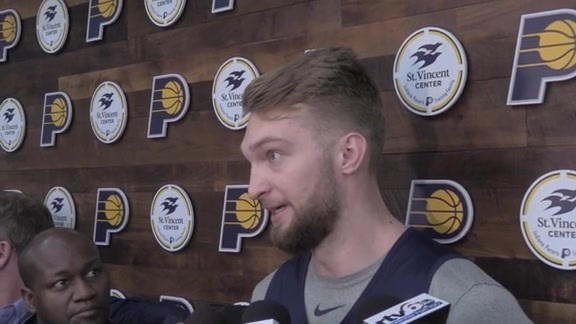 The brightest spots amid the dim evening were Domantas Sabonis and Cory Joseph. Sabonis finished with team-highs of 17 points and 12 rebounds for his 30th double-double of the season, 27 of them of the bench. Joseph, who had hit just 24 percent of his field goal attempts, including 21 percent of his 3-point shots, over the previous 16 games, hit 5-of-9 attempts against the Nets, including 2-of-4 3-pointers. The followed a second half against Boston on Friday when he hit both second-half shots, one a 3-pointer. "I knew it was going to come back," he said. "Today I had my legs under me; my legs felt good. I was able to get good looks and today they went down." Now the Pacers need to find their legs again. They're limping and the clock is ticking.